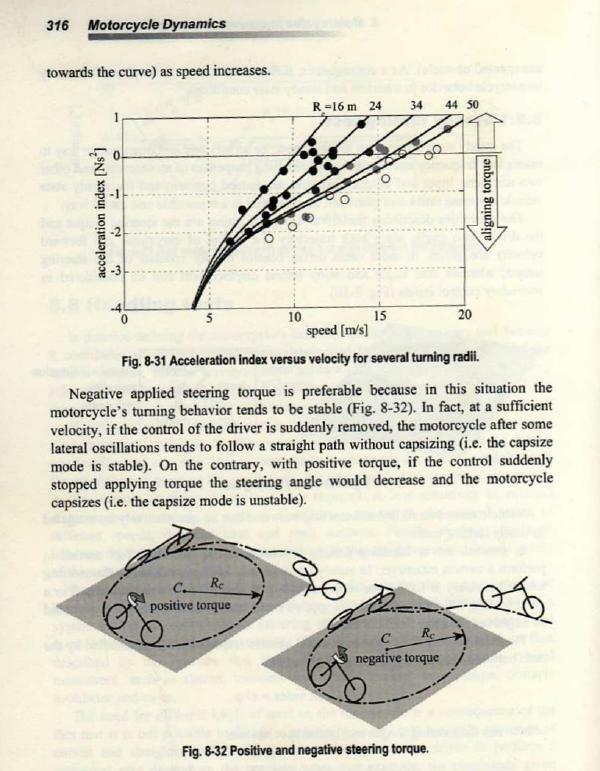 Motorcycle dynamics are hugely complex and difficult to quantify, let alone understand. Because they are so complex it is generally true that even experienced riders resort to over-simplifications, short-cuts, concept only, and abbreviated reality (snapshots in time) when describing them. As a result, any discussion that purports to be a critical analysis of the subject is easily sidetracked with honestly held claims and counter-claims by the participants about the specifics. I will here try to broaden our understanding of just one such dynamic: the behavior of a motorcycle while in a turn with a specific focus on steering inputs required to MAINTAIN a curved path. That is, the part played by 'counter-steering' once a bike is leaned over and already riding a given radius curve. In any discussion of counter-steering it becomes obvious that in order to begin a change of direction (enter a curve, for example), the rider, if traveling at speeds greater than about 10 mph, MUST provide a steering input that involves a 'negative torque' relative to the direction the rider wishes to move. By that I mean that if a rider wishes to cause his motorcycle to move to the RIGHT, he must input a LEFTWARD (counter-clockwise) steering torque. As a result of that negative torque, the bike will lean to the RIGHT and THEN begin changing direction to the right. I have maintained that the rider MUST maintain some measure of negative torque throughout the turn in order to maintain it. That is, he must maintain a certain amount of forward pressure on the inside grip throughout the turn else the bike will, of its own accord, attempt to straighten itself out and abort the turn - ending up moving in a straight direction. However, there are 'tuning points' where a specific speed and turning radius can result in a motorcycle that requires no steering input to maintain its path. Others, notably a very experienced (and credible) sport bike rider, alleges that his bike provides 'neutral steering' so that once he gets into his turns he is able to provide ZERO steering input in order to maintain them. Indeed, he claims that he could even take his hands off the grips entirely and the bike would continue the course it was in before he did so. Those two positions sound entirely impossible to reconcile as they appear to be making diametrically opposite claims. But is that really the case? Could it be that both positions are valid and demonstrably correct? By the time you complete this article (and absorb it) you will find that both positions are correct and can be demonstrated. They are both 'concept statements' utilizing a host of assumptions and simplifications of reality, and both involve 'snapshots in time'. A motorcycle's handling behavior cannot be reduced to some magical number, an index, where the higher or lower that number is, the better it is. A touring bike, for example, is expected to be stable at virtually any speed yet it is lacking in agility, while a sport bike must be able to be quickly leaned into a turn (flickable), particularly at higher speeds, but most sportbikes are not well known for being stable while moving in a straight line (steering head wobble, for example). Which 'handles better' is a rider's personal choice. Most of you know that a motorcycle is generally an over-steering machine while automobiles are generally under-steer machines. What that means is that a motorcycle, while in a turn, will have a greater slip angle of the rear tire than of its front tire. Indications of that are that if you pass the critical speed of your motorcycle in a turn, the rear tire will be the most likely one to slide out from under you leaving your bike pointed INTO the turn. An over-steering machine tends to carve a tighter turn while an under-steer machine tends to carve a wider turn for any given steering input. A neutral-steering machine has the same slip in both the front and rear tire while in a turn and the turn that is described as a result is known as an 'ideal'. Note that we have just discovered a problem with the sport biker's assertion that his bike has 'neutral steering': He does NOT mean that his front and rear tires develop the same slip angles in a turn! He means that he requires ZERO steering input to maintain a turn once it has started. The use of an otherwise well known and defined term like 'neutral steering' to mean something other than its formal definition is at the very least confusing, but we know from the context of the argument what he actually means. There are only three degrees of movement freedom for a motorcycle when traveling on a flat surface: Pitch (where the bike's front-end gets higher or lower than its rear-end), Roll (where the bike leans to the left or right), and Yaw (where the bike's front-end turns to the left or right relative to its rear-end). These are NOT independent of each other in the case of a motorcycle. For example, when a motorcycle rolls (leans) to the right, because the front tire is narrower than its rear tire, there is an automatic YAW of the bike to the LEFT! This is a graphic showing the front and rear ties of a typical bike from the rear with the bike absolutely vertical and with zero steering angle. 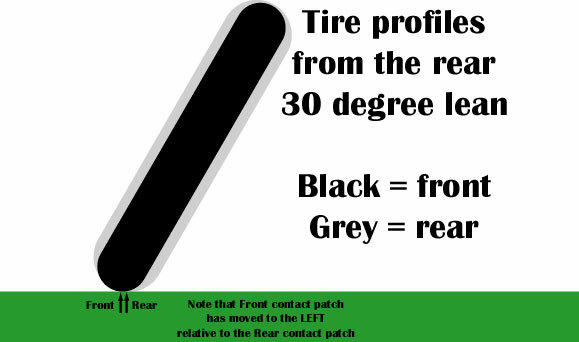 Note that the center of their contact patches is in the dead center of each tire. Who in their right mind would have believed that by merely leaning a motorcycle to the right that motorcycle would veer to the left, given that its steering angle remained zero? But that's a fact! By leaning it to the right you automatically yaw the bike to the left. So now you already see that determining the dynamics (how a bike behaves) is not at all a simple effort. One cannot simply assert that leaning a bike to the right results in a turn to the right. From other discussions on the matter we have seen that when a bike leans to the right as a result of counter-steering input turning the handlebars to the left, what immediately follows is an automatic turn of the front wheel to the right. This, the result of the 'righting moment' generated by trail. And as a result of that steering input the bike begins to move in a new path, to the right of where it was pointing when the counter-steering began. So now we are at the point where we begin to see the problem we are trying to deal with: how do we maintain that directional change? You may do so at an infinite number of different speeds, of course, though at no higher a speed than what exists when a hard part firmly strikes the ground. What's different between the dynamics of the bike when you maintain a turn radius and just vary the speed? Well, for certain the bike's lean angle is different. We know that the faster you go in that turn, the greater will be the lean angle. We also know that the faster you go in that turn, the higher will be the lateral (centrifugal) force. That, in fact, is why the lean angle is greater. But that also means that the amount of tire slippage on the front and rear tires changes (gets larger). But do they get larger in equal proportion? It turns out, as most of you know, that the faster you go in a turn, the smaller your steering angle will be. At highway speeds, for example, your steering angle never reaches a significant size as compared to when you are doing parking lot practice at appropriate speeds. Thus, along with greater lean angles, greater lateral force, greater slip angles, there is a smaller steering angle. 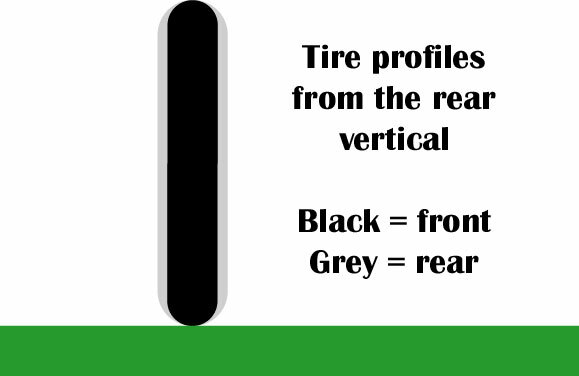 And that means that the amount of out-tracking done by the front tire (essentially its slip angle) is NOT simply larger than it is at slower speeds. The faster you go in that turn, the LESS negative torque (forward pressure on the inside grip) is required to maintain that turn!!! Indeed, based on the geometry of the front-end as well as the length of the bike's wheelbase, there can be as little as ZERO torque required to maintain that turn, and if you increase speed even more, you will begin to need a positive torque on the steering stem to maintain it. What I have just said is that there are tuning points for any bike where the speed and radius of a turn result in what our sport bike advocate claims is 'neutral steering'. I also just said that the vast majority of speeds used to ride that turn REQUIRE a counter-steering pressure to maintain it. We will examine the rather confusing graph at the top later in some detail but for now I ask you to read the paragraph at the bottom of that page. In that paragraph he tells you why requiring a negative steering torque (forward pressure on the inside grip) is the preferable state for riding in a curve. Look at the diagrams at the bottom of that page and you will see what happens to the bike's path when you remove your hands from the grips if positive torque is required (on the left) or negative torque is required (right). You see on that the path on the right suddenly gets tighter (the result of the righting moment) which acts as a counter-steering input to widen the path and straighten the bike up to vertical. But in the case where a positive torque is required, removing your hands from the grips results in the path opening up and the bike becoming unstable and FALLING OVER. What our sport bike advocate declares is that 'neutral steering' results in no change in the path of the bike if he removes his hands from the grips. So now let's look closely at the top graph and make sense of it. Here I have added mph and feet translations for the metric meters per second and meters indexes along the top and bottom of the graph. 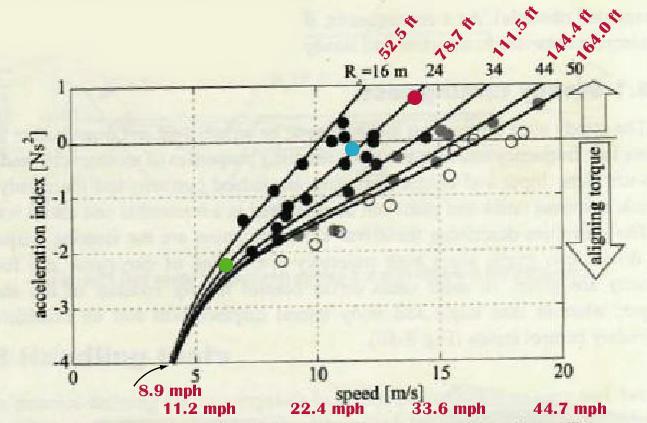 Along the left axis is what is called the Acceleration Index. That is merely the amount of torque required divided by the amount of lateral force, When that number is negative it means a negative steering torque is required to maintain a turn; when it is positive, a positive steering torque is required (and the bike becomes unstable if you stop doing so); and finally, if it is zero then the bike is in what our sport bike advocate claims to be a state of 'neutral steering' where NO steering torque is required to maintain the turn. Along the bottom is the speed the turn is being made at and along the top we see the radius of the turn being made. A VERY INTERESTING part of this chart is that for this bike (a sport bike, by the way), counter-steering appears to start at just less than 9 mph!!!!! Anyway, each of the curves on the chart represents a set of measurements of required steering torque to maintain a turn of a given radius. 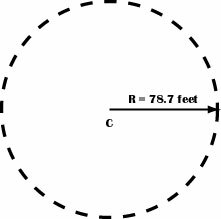 For example, the second curve from the left shows the measurements of steering torque required to maintain a path on a circle with radius of 78.7 feet at speeds from about 9 mph to as high as about 30 mph. Notice that as speed increases the amount of negative steering torque decreases until you finally get to a point that the bike is 'neutral steering' and that at any speed above that point the bike requires positive steering torque (and is unstable). I have highlighted with colors three of the test measurements made for the 78.7 foot radius curve to make this crystal clear to you. Increasing speed to about 30 mph, as is shown with the red dot results in your having to provide a POSITIVE steering torque (pushing forward on the OUTSIDE grip) with a magnitude of nearly one, your bike will be unstable, and it will be leaning about 37 degrees. Touring bikes and cruisers have curves that are wider than sport bikes so that you rarely, if ever, can find a 'tuning point' with them where you can experience 'neutral steering'. Even at high speeds in a turn the amount of friction from any steering damper is not a significant factor in offsetting the righting moment so you must maintain some forward pressure on the inside grip to maintain your course with these bikes. Though I don't know this to be true, it seems reasonable that because the faster you go in a turn the greater will be the lean angle and the lesser will be the amount of negative steering torque required, it just might be that many of us find it very difficult to lean a bike over far enough to scrape a peg as the steering input simply feels 'strange' (weak) the closer you get to that point. Anyway, clearly both arguments are valid and demonstrably correct.